Is your data on a native grid? A native grid is a grid that is on a particular map projection. In order to plot the data correctly over a map, you must know the exact map projection and all its parameters. You will then plot the data over this map projection without needing to do any kind of mathematical transformation. 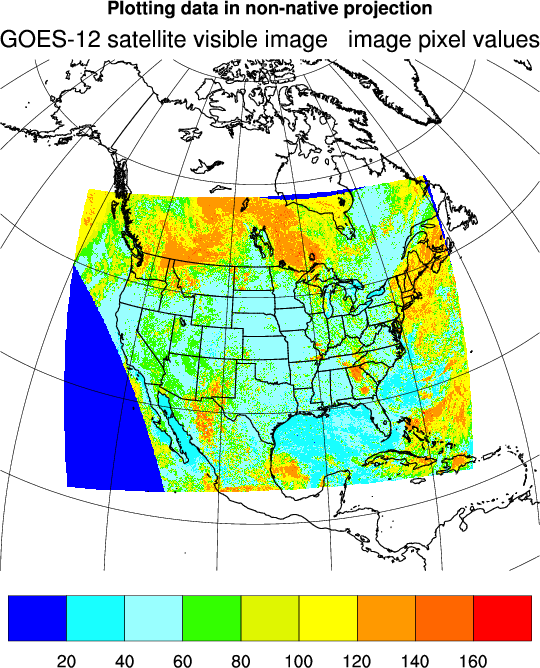 To plot native grids, you must set the resource tfDoNDCOverlay = True, so that the data doesn't go through a mathematical transformation to be overlaid on the map. Additionally, you commonly want to set the resource mpLimitMode="Corners" to specify the area of the map to zoom in on. This resource must be accompanied by resources for setting the four corners of the map area to view: mpLeftCornerLatF, mpLeftCornerLonF, mpRightCornerLatF, and mpRightCornerLonF. pmTickMarkDisplayMode = "Always" turns on the automatic tickmarks. Lambert conformal native grids have been given their own page. native_1.ncl: An example of a Stereographic native grid. mpProjection = "Stereographic", sets the projection. For this grid, you must set the center lat (-90 or 90) and center lon, sometimes referred to as the "orientation". A common way that these grids are described is to give the orientation, the delta X and delta Y at some arbitrary latitude and the coordinates of the pole in integer grid coordinates. Coming up with corner lat/lons is difficult when this is the only information provided. See native_6.ncl below for a script that helps you to find the correct values for the map projection resources. native_2.ncl: An example of a Mercator native grid. mpProjection = "Mercator", sets the projection. This projection requires that the "corners" method of specifying the map boundaries be used. (see example 1 above). native_3.ncl: Like example 4, this GRIB file has attributes that make plotting the native stereographic projection easy. 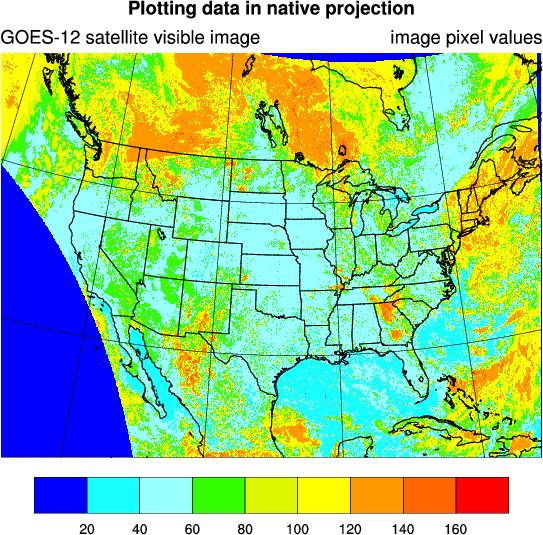 native_5.ncl: This example shows how to plot geoscientific data in its native projection, and then how to calculate the lat/lon values of the projection so you can overlay the data on a different map projection. native_6.ncl: This script is similar to native_1.ncl, except it compares plotting the data using both native and non-native settings. 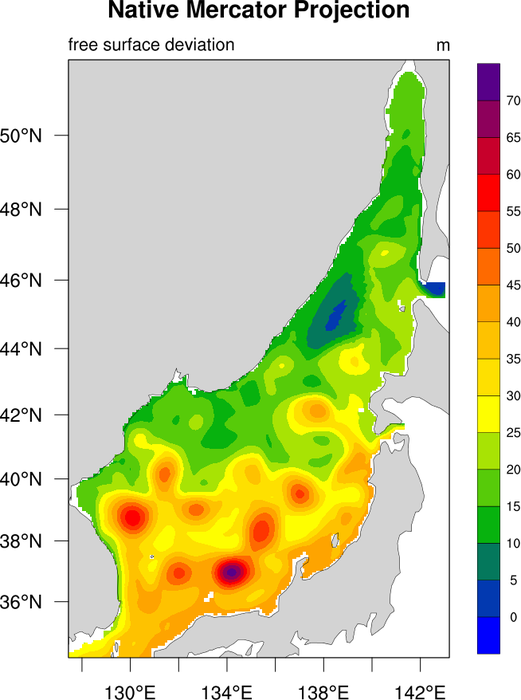 Plotting data in its native projection means that you MUST set the exact parameters of the native map projection or the plot will not be correct. 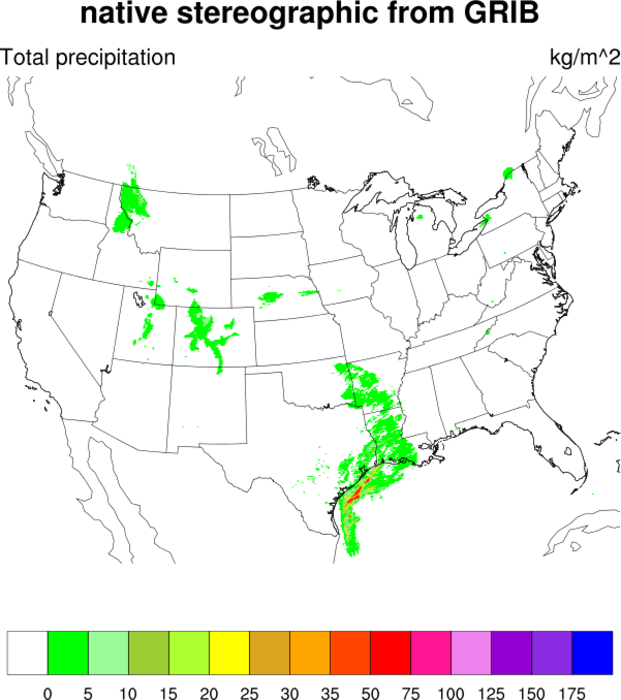 To plot data in its native projection, you must set tfDoNDCOverlay to "NDCViewport" and then all the correct map projection resources. We didn't know what the correct relative center longitude value was for the native projection, but we had a rough idea that it was around 9.9 (since this was the rough center of the data's lat/lon grid). To debug this problem and try to find the correct value, we created a do loop to try different guesses around longitude=9.9. We also added every other lat/lon grid line of the data using gsn_coordinates to see if the lines were straight. If they were, then this was a good sign that we had the correct longitude. Using this loop, we determined that longitude=10 was the correct value. We then compared the native plot with a plot where the lat/lon arrays were provided by attaching them as "lat2d" and "lon2d" to the data being plotted. This gave us another way to check that the native plot we had was correct. To plot data this way, you must set tfDoNDCOverlay to "DataTransform" (which is the default). It doesn't matter which map projection you use in this case, but we used the same map as the native plot so we could directly compare them. Note that in NCL version 6.4.0 and earlier, the gsn_csm functions only allow you to set tfDoNDCOverlay to True or False. Setting it to True is the equivalent of setting it to "NDCViewport", and setting it to False is the equivalent of setting it to "DataTransform".